ALBUQUERQUE, NM— The Summer Nights Concert Series returns to the ABQ BioPark for its fourteenth season. Each Thursday, June 16 – August 18, enjoy musical performances, food, and fun at the Botanic Garden. Summer Nights is sponsored by the City of Albuquerque, Lite 95.1 FM, Best Western Rio Grande Inn and 104.7 Classic Country. Artists from diverse genres, including folk, blues, Celtic, jazz and more, are featured in the beautiful garden setting. 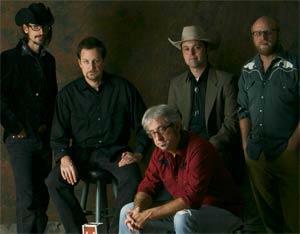 Summer Nights begins June 16 with the rockabilly and country-western sounds of Halden Wofford and the Hi-Beams. Gates open at 6 p.m. and concerts start at 7 p.m. Tickets are $10 for adults, $5 for seniors (65+) and $3 for children (3-12). Season passes are also available for a savings of 25%. Tickets can be purchased on event night or in advance online or from BioPark cashier. For a full schedule of performances, see www.abqsummernights.com. Magic shows by Clan Tinker and the antics of the Ritzy Rouge Hoop Troop are back this year. The Aquarium, Heritage Farm, Japanese Garden and Garden Railroad are open until 8 p.m. The PNM Butterfly Pavilion is not open for this event. Bring a picnic or purchase food onsite. Beer and wine are available for purchase. No alcoholic beverages may not be brought into the Garden. Blankets and folding chairs are welcome. Caption: Halden Wofford and the Hi-Beams. Photo courtesy of Mary Staley Prigden.